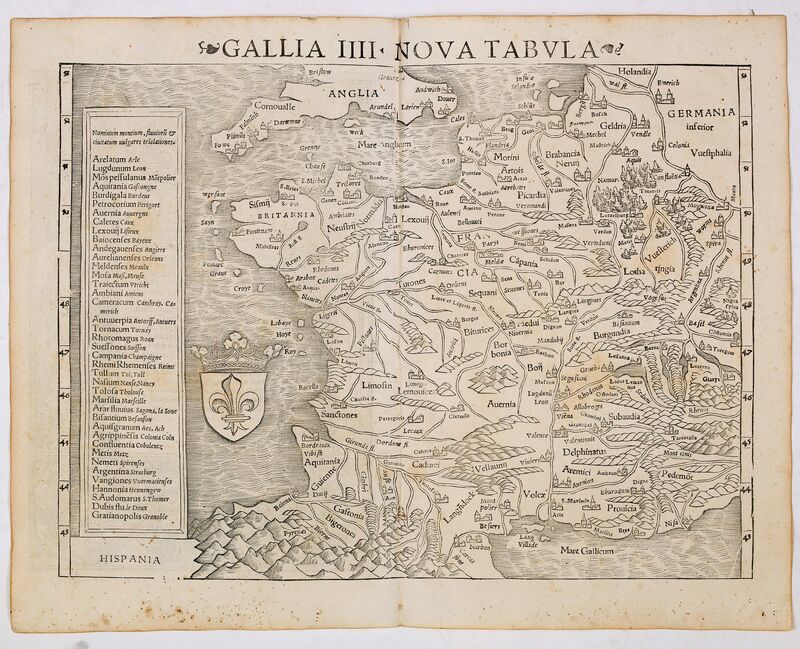 Gallia IIII Nova Tabula (France) - MÜNSTER, S.
Title : Gallia IIII Nova Tabula (France). Date : Basel, Heinrich Petri, 1545. Size : 10.2 x 13.2 inches. / 26.0 x 33.6 cm. Description :Sebastian Münster's map of France. Appeared in his "Geographia Universalis", first published in 1540. On verso a decorative woodcut border who were probably cut by the famous 16th century woodcutter Hans Holbein. The Geographia was landmark work which contained, along with the Ptolemaic maps, several of the most significant modern maps in the history of cartography. Sebastian Münster (1448-1552) was a mathematician, geographer and professor at Basel University. He also compiled a highly influential encyclopedic work entitled Cosmographia universalis, which first appeared in 1544 and contained forty-eight woodcut maps. He was among the first editors of a published geographical text to quote or acknowledge his sources and authorities. Now-a-days difficult to find in original untouched condition, as most examples on the market have modern colour added. Read more about Sebastian Münster. Condition : Woodblock map with letterpress on verso. Paper with usual age-toning. Very good throughout. Paper size 300 x 380mm.